Blog DeskDirector Business Blog MSP Marketing: How to Train Your New Marketing Hire? We got in touch with marketers of three leading MSPs in Australia, Evolve IT, C3 Group and Power-Net to share their experiences with us to help your onboard your new marketers. Our three experts will talk about their experiences and offer their tips. Lachie Dixon from Evolve IT has had a decade of experience in the IT Industry and decided to make a switch to the marketing side. He is a self-taught marketer and usually has interns working alongside with him. Jayde Austin is a full-time marketer with no previous IT experience and has been working with C3Group for the past 2.5 years. She currently runs the marketing ship solo. Samuel Savvidis an MSP Marketing Assistant who has been working with Power-Net for past 5 months under John Lane, Marketing Manager. He was the first intern hired by the company, which was a different experience for John and Samuel. MSPs usually have a structured training program for their customers to onboard. You can use this same methodology to create a structured onboarding process for your new hires. Until they're trained, they're not living up to their potential. It is crucial for them to move past this stage as soon as possible. It is often daunting to be the new kid on the block; you must make sure that they are introduced to the whole team. Encourage a team lunch which will help in building a bond within the group. Give them a brief of the business operations and culture. Ideally, the direct supervisor should be briefing the new hire. It would be a good opportunity to know them better. Usually, MSP Marketers fly solo, in that scenario – account managers or sales director can help them onboard. Jayde tells us about the initial meetings with the directors who helped her immensely with understanding the MSP operations. They talked about the past, present and future strategies helping her put all the priorities in place. Samuel from Power-net also talks about how his manager showed him the ropes initially which put him at ease. MSP is a niche industry. Unless the marketer has worked for one before there are chances they are unaware of its intricacies. Provide them with material that gives them an overview of the industry. We suggest this article ‘An MSP Example Buyer Persona’ as a good starting point. You can automate this process by creating an employee playbook which has all the details you would want your new employees to know. The book can consist of company values and objectives, stakeholders and customer information. Here is a checklist you can follow. For example, C3Group was aware that Jayde didn’t have a background in the IT Industry, but they saw this as an advantage. They wanted someone to simplify the complex technical concepts so that their customers and prospects could clearly see the benefits to their business. 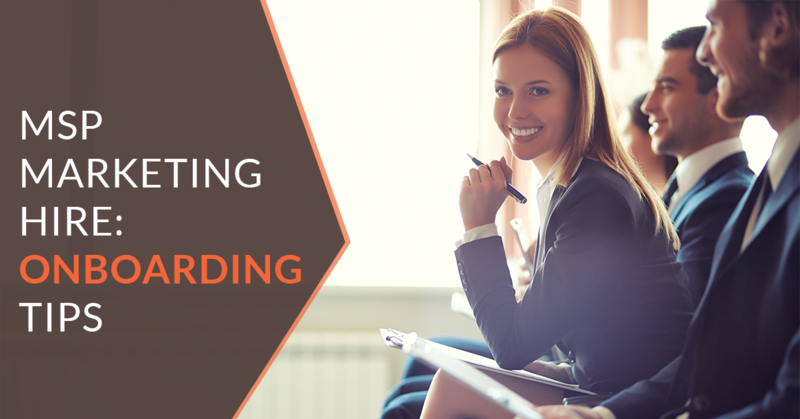 Encourage online certifications, which will help them upskill Here at DeskDirector, we follow the Inbound Methodology. All our new hires are encouraged to not only complete the certifications but also attend all helpful events. Lachie Dixon from Evolve IT encourages his interns to complete a certification per week so that they are job-ready as soon as possible. The certifications empower new hires to grow their skills within the company, as well as provide valuable knowledge for the future. Good marketers know they can never stop learning. This industry changes so fast that it’s essential to keep up. However, once engrossed in their work, many people allow professional development to lapse. You should set an example by renewing all your certifications before encouraging them to complete theirs. When they see that you haven’t stopped learning, they will want to imitate the behavior. All marketing campaigns need goals, and so does your onboarding process for new hires. They cannot aimlessly work without a concrete plan. You should have their rough quarterly goals outlined before they arrive. Help them set up their monthly goals. Their goals should be in sync with the objectives of the firm. Give them tips on how to achieve their goals and then share your personal experiences, but give them the space to consider their own approaches. MSP marketing can only be effective with organized goals and a detailed and researched strategy. As Jayde was the first marketing hire for C3Group, she was the one who set up the goals and marketing plans after her meetings with the stakeholders. This helped her get clear on the firm’s objectives. Pro Tip: Don’t force or strongly recommend a process unless necessary. Your new hire might have a different approach which could be more efficient. Welcome the change in approach with caution and guide them along the way. For a marketer, it’s essential to understand the service or a product the company provides. Include product or service learning in their quarterly goals, and allow them time to sit with developers and salespeople or listen in on sales calls to dig deep into what customers need from the service/product. Before they go on to business-as-usual, it’s paramount that they have a clear understanding of what your MSP business does. They’re familiar with your Unique Selling Point and understand what differentiates you from your competition. Jayde from C3Group was encouraged to experience tools like ConnectWise firsthand so she has a complete understanding of the company. Now, when she works on marketing strategy, she does so from a position of knowledge and a deep understanding of customer needs. Samuel from Power-Net was helped by his manager to learn about the company and the services they provide. Pro Tip: A better understanding of the market and your product will lead to better and more accurate marketing strategies. Strive to build a positive company culture and give your new marketing hire an encouraging environment. Patience is key and helping them to get on board can sometimes be very taxing. Through this whole process, you must make sure that they are not dependent on your guidance – provide space for them to take the initiative, even if they do make mistakes. Lachie from Evolve IT lets his interns handle small tasks by themselves. He encourages them by giving the interns power over small areas like social media platforms, then gradually introducing them to more responsibility. He mentioned, “Josh, our intern is doing an excellent job.” This kind of encouragement is an incentive to work harder. Samuel from Power-net fondly talks about the positive environment and his motivating leader who pushes him to do well. Just like Josh, Samuel is given small tasks to accomplish and provided with increased responsibilities as he grows. Constructive feedback can go a long way in helping your new hire learn the company systems and technology stack. Provide examples of your previous work and ask them to take inspiration or draw conclusions from what’s worked in the past. Pro Tip: Feedback should include positive encouragement as well as ways to improve. If all you do is offer criticism, then you can cause new hires to lose confidence. Let them know when they’re doing well! Onboarding a new hire isn’t just a project for you as a manager – it’s up to the whole team to make them feel welcome. The team should collectively work towards finding the efficient way to work and building new habits. Respecting the other person and their work is essential. Marketing is not an exact science, and people are bound to have a differance of opinion. Be open to new ideas and ways of working – after all, that’s why you hire new people in the first place. See our MSP Marketing Tips, which will help you gain the trust of your prospects. Best of luck with your new MSP marketing hire!